Hyphantria cunea, the fall webworm, is a small to medium size (FW length 15 - 17 mm) nearly entirely white moth. Both fore- and hindwings are pure white, occasionally marked with one or two black spots along the postmedial line on the forewing and at the discal spot on the hindwing. The head, thorax, and abdomen are also white, but the femur and tibia of the foreleg are yellow and black. The bipectinate antennae are white dorsally with gray processes. This species can be differentiated from all other white moths by the combination of unmarked wings, white abdomen, and yellow forelegs. 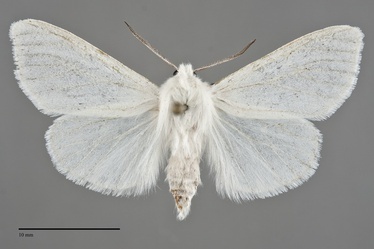 It is most similar to Spilosoma congrua and S. virginica. Larva is black with red scoli or tubercles covered with tufts of long white hair, and is illustrated by Miller & Hammond (2003). This species is common to abundant in forest and riparian habitats across much of North America, and may experience epidemic outbreaks. In the Pacific Northwest, it occurs in all forest and riparian habitats at low to mid elevation, but is usually rather uncommon. However, epidemic outbreaks are particularly likely in more disturbed urban areas and agricultural orchards. This species is widely distributed throughout our area. Most records from the western part of our region are from the Willamette Valley, Puget Trough, and Lower Fraser Valley. East of the Cascade axis it is most common in foothills, although can be found wherever there are trees. British Columbia records are mostly from the southern third of the province, with a northerly record from Atlin. This species is found throughout temperate portions of North America north of Mexico. The distribution is spotty in the intermountain west and it appear to be absent from southern California. This species is a generalist feeding on a great variety of hardwood shrubs and trees, and is frequently a pest in fruit and nut orchards. The larvae are communal and live in a web at the tips of branches of their hostplant. These webs are more commonly observed than the adult. Hyphantria cunea has been collected throughout summer but is most common in June and July. It is nocturnal and comes to light. 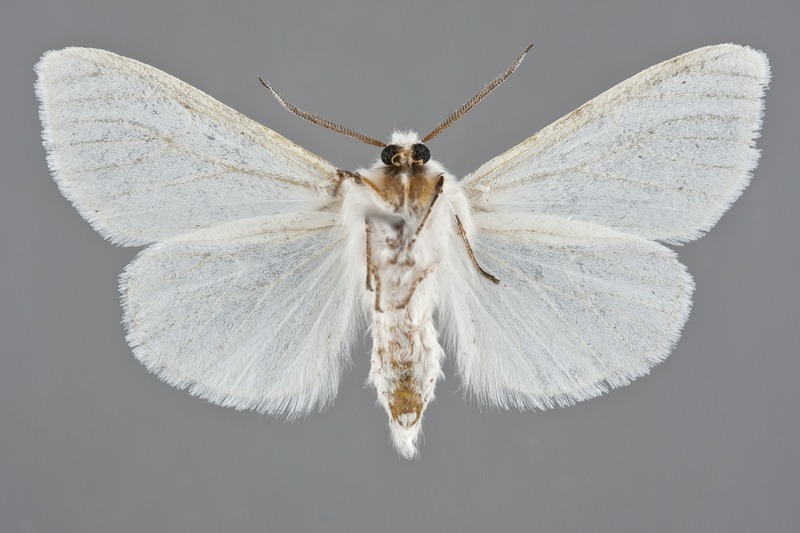 Hyphantria cunea is a pest on a variety of hardwood trees and shrubs.